In many ways the quintessential chamber music medium of the Baroque period was a soprano voice in combination with a continuo instrument such as the theorbo or archlute, playing a semi-improvised part to match the flexibility and dramatic expressiveness of the virtuosic solo vocal line. Elissa Edwards and Richard Kolb bring together a unique combination of virtuosity and scholarly expertise in exploring the vast untapped resources of 16th and 17th-century solo vocal repertoire, little of which has been heard by modern audiences. Recent programs have featured works by Italian singer/composers Francesca Caccini and Barbara Strozzi. Some of their other programs explore music of the world of Galileo Galilei, and song from the time of English the civil war and Restoration. The life and career of Barbara Strozzi is a remarkable narrative of a supremely talented woman's triumph over the injustices of a harshly patriarchal society, but her importance today rests on the inspired beauty and virtuosity of her arias and cantatas. In recent years, as Strozzi's music has gradually been re-discovered (thanks in part to the availability of her music in Dr. Kolb's modern editions), she is becoming recognized as one of the leading composers of vocal chamber music of the seventeenth century. In the seventeenth century intellectual and artistic achievements by women were generally considered to be dangerously disruptive to social order, yet through strength of character and intelligence in deploying her musical talents Strozzi established a reputation that commanded respect on a level with the leading male composers of her day. She was the adoptive (probably illigitimate) daughter of Giulio Strozzi, a famous poet and librettist with unconventional ideas about the place of women in society, and he provided her from early childhood with the highest level of musical education. By the age of fifteen Barbara was renowned as a singer, and at twenty-five she published a substantial volume of her own compositions, a blatant challenge to male-dominated society. The early part of Barbara's career and publication of her first volume were largely made possible through the influence of her father and the protection of the volume's dedicatee, Vittoria della Rovere, the Grand Duchess of Tuscany. However, Giulio Strozzi's death in 1652 left her without her principal means of access to elite society, precariously situated as the mother of four illigitimate children, with no financial resources beyond what she could earn for herself. She responded by producing seven volumes of vocal chamber music within a period of twelve years, all of the highest standards of inspiration and craftsmanship, a feat unmatched by any other composer of the seventeenth century. Richard Kolb's association with Strozzi began in 1996, when he performed some of her works at a festival of women's music in Kassel, Germany. Strozzi's then little-known music made such an impression that it attracted the attention of a German publisher, at whose request Kolb edited two volumes of Strozzi's works which are still in wide circulation. Years later, after completing a Ph.D. focusing on seventeenth century vocal music at Case Western Reserve University, he was inspired to publish more of Strozzi's music, and this turned into the first modern edition of Strozzi's complete works in seven volumes, which is now nearing completion and published by Cor Donato Editions. In 2015 Richard met soprano Elissa Edwards, and quickly realized that he had finally met an ideal singer for Strozzi's demanding music, with the rare combination of a flexible and powerful voice, brilliant technique, a well-developed understanding of the issues of Baroque performance practice, an engaging personality, and a lively musical imagination. 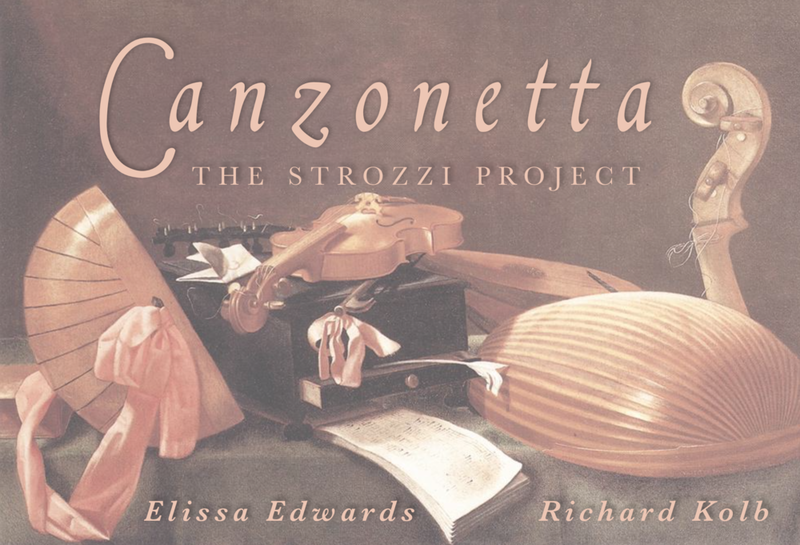 Since then Elissa and Richard have been working steadily on mastering the many challenges of performing Strozzi's highly virtuosic works. They are now at the start of an ambitious recording project, beginning with a two-CD recording of Strozzi's Opus 8, her last known works. Lutenist Richard Kolb has performed throughout North America and Europe as a soloist and with a wide range of Baroque ensembles, including Opera Atelier, New York City Opera, Les Musiciens du Louvre, Chicago Opera Theater, Waverly Consort, Handel & Haydn Society, Pegasus, and Concert Royal. He combines a career as a performer with scholarship in the field of 17th-century music, and is nearing completion of the first modern edition of Barbara Strozzi's complete works, in seven volumes published by Cor Donato Editions. He recently recorded a solo CD of lute music by Robert Ballard, scheduled for release in 2018. Kolb is Scholar in Residence for the New York Continuo Collective, and has been on the faculty of the University of Toronto, and the Royal Conservatory of Music (Toronto) and Case Western–Reserve University. Richard Kolb is currently nearing completion of the final volume of the first modern edition of the complete works of Barbara Strozzi. All the editions are available from Cor Donato Editions in both print and digital formats.